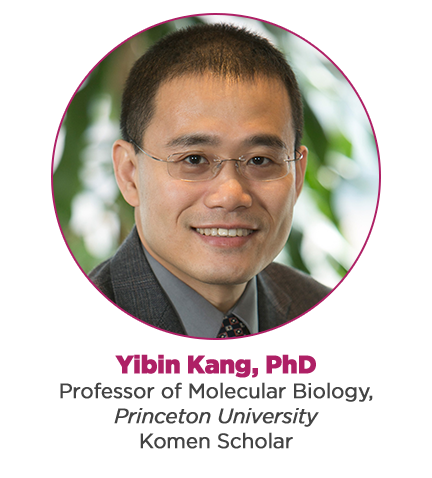 Yibin Kang is a Warner-Lambert/Parke-Davis Professor of Molecular Biology at Princeton University and an Associate Director of Rutgers Cancer Institute of New Jersey. He graduated with a bachelor’s degree from Fudan University in Shanghai in 1995. After completing his graduate study at Duke in 2000, Dr. Kang became an Irvington Institute postdoctoral fellow with Dr. Joan Massagué at the Memorial Sloan-Kettering Cancer Center and pioneered a functional genomic approach to elucidate mechanism of breast cancer metastasis. Dr. Kang joined the faculty of Princeton University as an Assistant Professor of Molecular Biology in 2004. He was promoted to Associate Professor with tenure in 2010 and to Endowed Chair Full Professor in 2012. Dr. Kang is President of the Metastasis Research Society (2016-2018), Chair of the American Association for Cancer Research (AACR) Tumor Microenvironment Working Group (2018-2019) and President-Elect of Chinese Biological Investigator Society (2018-2020). Dr. Kang’s research focuses on the molecular mechanisms of breast cancer metastasis. His laboratory applies a multidisciplinary approach to analyze the molecular basis of cancer metastasis, combining molecular biology and genomics tools with animal models and advanced in vivo imaging technologies. His work discovered new genes that promote recurrence, metastasis and chemoresistance of breast cancer, delineated tumor-stromal interactions that are essential for metastatic growth, and identified novel regulators with dual functions in mammary gland cell fate determination and tumor progression. Dr. Kang has published over 140 original articles in leading journals including Science, Cancer Cell, and Nature Medicine. Dr. Kang’s outstanding achievements have been recognized by many prestigious awards, including a Department of Defense Era of Hope Scholar Award (2006), the 2011 Vicek Prize for Creative Promise in Biomedical Sciences (2011), and the American Association for Cancer Research (AACR) Award for Outstanding Achievements in Cancer Research (2012), the Fidler Innovation Award from the Metastasis Research Society (2014), the Fuller Albright Award from the American Society for Bone and Mineral Research (2014) and the AACR Outstanding Investigator Award in Breast Cancer Research (2014). Dr. Kang was elected as a Fellow of American Association for the Advancement of Science (AAAS), a Komen Scholar, and an inaugural inductee of the Duke Graduate School Few-Glasson Alumni Society in 2016.